SAKYAMUNI BUDDHA STATUES WITH DIFFERENT HAND GESTURES AND MUDRAS, AVAILABLE IN THREE SIZES. Product Code BUD004/005/006 are Buddha Sakyamuni Statues available in various sizes, hand gestures and price ranges. Buddha Sakyamuni represents the power of an enlightened mind and is the Buddha of Healing and Meditation. The item is a wonderful gift to yourself or any other person, and can be displayed or used as an item of prayer. The various hand gestures are the buddhist ritualistic mudras, each symbolizing different moods and prayer forms. Each Buddha statue is unique and has its own mudra to further enhance the spiritual energies of the idols. Details of the mudra's shall be provided in the special buddha bazaar packages used for shipping for your information. 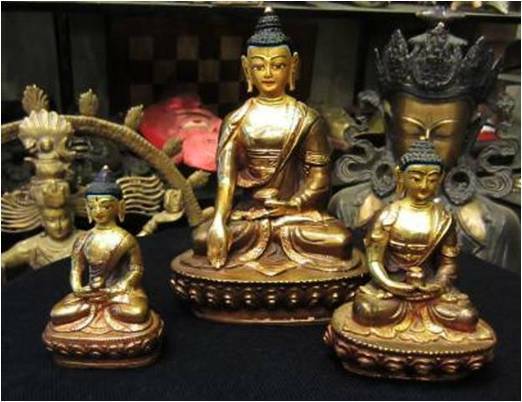 All items are gold gilded multi-shaded bronze, hand-cast Buddha figurines in three different sizes and price ranges. SAKYAMUNI BUDDHA STATUE LARGE WITH INSCRIBED SCROLL. Scroll: Specially Priced Buddhist Blessing Scroll with blessings from a High Buddhist Monk. SAKYAMUNI BUDDHA STATUE MEDIUM WITH INSCRIBED SCROLL. SAKYAMUNI BUDDHA STATUE SMALL WITH INSCRIBED SCROLL.